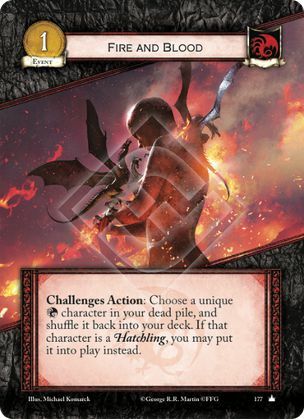 Challenges Action: Choose a unique character in your dead pile, and shuffle it back into your deck. If that character is a Hatchling, you may put it into play instead. Once a card leaves play, and then enters back into play, it is treated as a new card. Any icons lost, or strength reduced, or previously activated abilities are not "remembered" by the game state. So it's perfectly legal to trigger Rhaegal's "limit once per phase ability", kill Rhaegal to claim, revive him with Fire and Blood, and then trigger Rhaegal again.